Chaos. In Game of Thrones episode 3×6 ‘The Climb’ we got the calm before the storm. Several storylines begin to surface and it looks like it’s all-downhill from here for Season 3. Gilly: Is The Wall as big as they say? Sam: Bigger… So big you can’t even see the top sometimes. It’s hidden in clouds! Gilly: You’re playing with me…? Sam: Am not. It’s 700 feet high; all made of ice, on a warm day you can see it weeping. Such a poet, that Sam. Ygritte then teases him a bit about their sexual escapades; I bet he’d blush if he wasn’t so cold. Now that Jon Snow has proven himself to Ygritte, he doesn’t tolerate her teasing too much. He knows where he stands. Ygritte has figured him out, “you’re loyal, and you’re brave.” She knows that Snow is still loyal to the Night’s Watch and she intends to keep his secret. In exchange, she only asks for his loyalty. “You’re going to be loyal to your woman,” she tells him that they are just soldiers in an army, no one cares if they live or die. They have to depend on one another to survive, “it’s you and me that matter to me and you.” They’re the Bonnie and Clyde of Westeros. With that, they begin their climb. 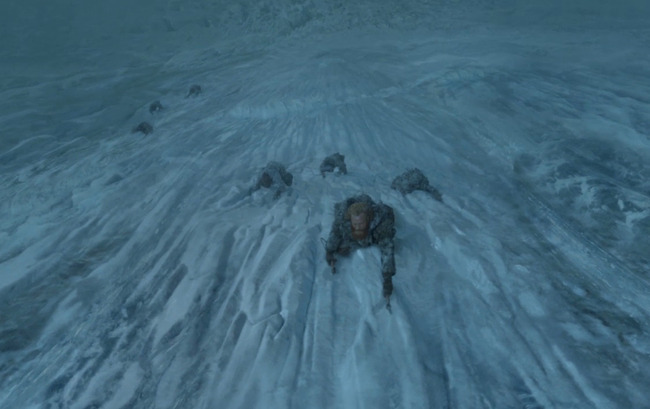 They’re trekking along when Ygritte notices a crack spreading along The Wall, large chunks begin to fall taking climbers with them. Jon and Ygritte lose their footing and are DANGLING off. She begins to swing him so he can grab hold of The Wall. Orell tries to cut them loose, but Snow connects with The Wall just in time. Ygritte had a point, I guess. The episode ends with Jon Snow and Ygritte reaching the top of The Wall; they made it. Together, they take in the view and make out a little bit and can you blame them? Overall this was a sweet scene, the calm before the chaos for sure. Arya – Arya is having an archery lesson with the Brotherhood Without Banners, when someone stops by for a visit. Melisandre, Stannis’ favorite lady in red is here to pick up something (or someone). First, she chats with Beric and Thoros about the Lord of Light. She’s quite impressed (and maybe a little jealous) that Beric has been brought back from the dead six times. The contrast here is so interesting to me, Beric’s Lord of Light seems forgiving and hopeful. When Melisandre talks about the Lord of Light, its scary and dark. Theon – Where in the Seven Kingdoms is Theon?! We have our theory, what is yours? Who is this person that is keeping him captive? What does he want? The Boy starts out by mocking poor Theon. He wants to play a game. The Boy chooses Theon’s little finger as the least important body part. Now, Theon is allowed to guess where he is and who the boy is, until he’s begging for The Boy to cut off his finger. “If you think this has a happy ending, you haven’t been paying attention,” The Boy says. Oooooh. Theon guesses The Boy is the son of Robb’s bannerman Karstark, you know, the guy Robb beheaded last week. The Boy entertains this for a while, let’s Theon experience seem relief, then GOT YA! Just kidding, that’s not who I am. He then peels off the end of Theon’s finger until finally, Theon begs for him to cut it off. Anyone else feeling sorry for Theon yet? I am astounded by the actor playing The Boy (Spring Awakening alum, Iwan Rheon). He is so good at playing crazy! Those eyes! That mocking tone in his voice! Can someone look into this, is he actually crazy?! Robb – You may remember last week when Robb decided to take Casterly Rock, but he needs the help of the Frey’s to do so. After marrying Talisa, Robb lost his only bargaining chip. He meets with two representatives from the Frey House to evaluate his options. Frey has three conditions: an apology (done), Harrenhal (okay), and Robb’s uncle Edmure must marry a Frey daughter. Edmure objects (just as much as Robb did), wants to know if he can pick. He argues, “No man can compel another man to marry.” Um yes, they can. 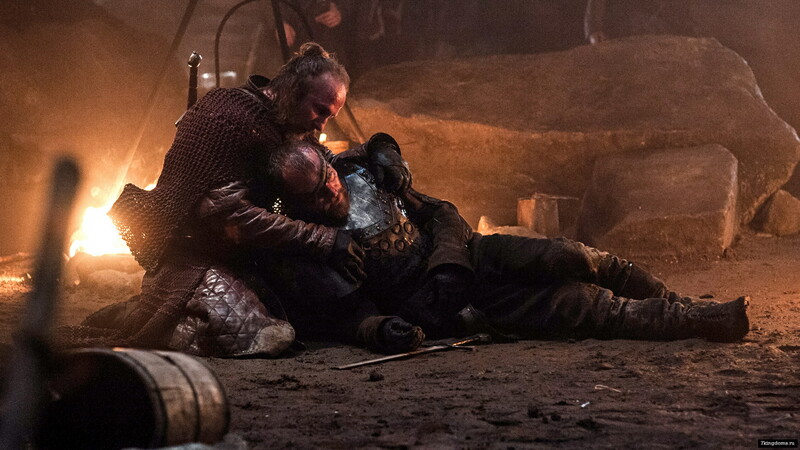 Robb reminds him of his big mistake with The Mountain and wins via guilt-trip. So it’s settled, Edmure will marry a Frey. I’ve got a bad feeling about this. Sansa – Sansa has a date with Loras. God, could their conversations get anymore boring? Could Loras be anymore gay? That leads us to the Lannisters. We finally get some Lannister action when we open to a nice dinner scene with Jaime Lannister, Brienne of Tarth, and Lord Roose Bolton. Brienne is dressed in a new outfit – a pretty pink dress. (She looks more uncomfortable than Loras pretending to like women.) Jaime is struggling trying to learn how to adjust to life with one hand. Brienne eventually has enough and slams her fork into Jaime’s steak to assist him in cutting. It seems his ego and attitude hasn’t quite adjusted, though. Lord Bolton and Jaime start to go back and forth on how many people would pay for Jaime’s freedom. “We both know who would pay the most, or make you pay the most if he found out you captured me and sent me back up North,” Jaime threatens Bolton. Bolton tells him he won’t sell him back to his father, but he will send him back to King’s Landing as long as Jaime swears to tell his daddy that Bolton didn’t maim him. The two come to a deal, except Bolton refuses to allow Brienne to leave with Jaime. “I’m afraid I must insist,” Jaime rebukes. But Bolton reminds Jaime, for what feels like the umpteenth time, that he is not in any position to barter. I mean, he literally has one hand and is surrounded by a garrison of Northmen. The next scene is a true delight to watch. Man, if there ever were two people meant to act on screen together, it’s these two. They’re literally a match made in heaven. Then Olenna drops her final attempt at avoiding the wedding. “Brothers and sisters, where I come from that stain would be very difficult to wash out.” Tywin seems cornered for a second, but he retaliates. They bounce pointed questions off each other until finally Tywin shuts it down. If Olenna refuses to marry Loras to Cersei, he will appoint Loras to the King’s Guard, making it so he Loras can never marry, reproduce, or become heir to High Garden. “It’s a rare enough thing, a man who lives up to his reputation.” Olenna out. And unfortunately, Olenna gives in. Loras will marry Queen Cersei. We have another loving family scene between brother and sister, Tyrion and Cersei Lanniser. The two banter back and forth about how bad their situation is, as each is being forced by their father to marry someone of his choosing. Cersei offers to have them both killed – meaning Sansa and Loras – but Tyrion doesn’t that’s an option. Cersei does something then that no one else did before – she gives Tyrion his due credit for saving King’s Landing and acknowledges that the city would have been sacked without him. Then Tyrion finally asks her the thing he’s been wondering most – did she try to have him killed in the Battle of the Blackwater? Shockingly, it wasn’t her but her son, King Joffrey. Tyrion figures this out because only two people can give an order to the King’s Guard – the King and the Queen Regent. Tyrion whines that Joffrey is an idiot, but really he’s just fearful that his life is still in danger. “Probably. But not from Joffrey, he won’t do anything while Father’s here.” Oh, won’t he? More on that later. Cersei tells Tyrion that she is fearful that the Tyrell’s will take power from the Lannister’s and “history will be taken from their hands.” It’s sort of refreshing to see these two bonding and brooding over their impending fates. Then, Tyrion has to do an unfortunate task – break the news to Sansa and her hand-maiden, Shae, about the upcoming nuptuals. Now here is one of the biggest mysteries in Game of Thrones. Why did they set up this scene perfectly, only to not show it?? We see Tyrion enter Sansa’s room and painfully realize he has to tell his lover that he’s betrothed to another woman. Your heart breaks for Tyrion because you can see the pain written all over his face, no pun intended. It’s ashame they didn’t show this. I would’ve paid a lot of money to see Shae’s reaction to Tyrion’s news. Then we have what I like to call a HPP – Huge Power Play. This one was sort of subtle, but still extremely impactful. Well played again, writers. Petyr Baelish and Lord Varys are in the Throne Room, having one of their playful conversations. We have seemingly innocent banter about the two of them competing with each other, and rooting against each other, until Petyr drops a bomb. He knows Ros betrayed him, he gave her to someone to do cruel things to her, and he thwarted Varys’ plan to marry Sansa off to the Tyrell’s. “She was a bad investment on my part.” This sent chills through my body, as I recalled the time in Season 2 when Petyr threatened Ros. “I did what I did for the good of the realm,” Varys responds painfully. This is the first time I ever saw Varys with fear on his face, but I still don’t doubt what he says. He seems like one of few people who may truly want what is best for the realm. Then comes the big reveal, as Petyr monologues about chaos (quoted above). King Joffrey is the man that took Ros and he murdered her by literally using her for target practice with his new bow. Varys failed to keep his promise to Ros and Petyr triumphantly leaves King’s Landing knowing he outwitted and outsmarted the Spider, much to the dismay of Sansa Stark, who is seen sobbing as she watches Petyr’s boat (and her last chance of escaping King’s Landing) sail away without her. It’s a shame to see a character like Ros go with another un-shown scene, especially since we’ve gotten to know her in the last few seasons. But in a way, I’m glad I didn’t see that. So thanks wrtiers, for saving me from a nightmare or two. No Targaryen action, much to my dismay. Hopefully, that will result in a double dose next week, or maybe even an entire episode dedicated to Dany. A girl can dream, right? Again, poor poor Gendry (see Stark). Categories: Game of Thrones, Recap, TV | Tags: Arya Stark, Baratheon, Beyond the Wall, Brotherhood Without Banners, catelyn stark, Daenerys Targaryen, Dany, Game of Thrones, GOT, GOT 3x6, HBO, Iwan Rheon, jaime lannister, Lannister, Lord of Light, Melisandre, Olenna Tyrell, recap, Red Priestess, Robb Stark, Sansa Stark, Small Council, stark, Targaryen, television, The Climb, The Hound, The Unsullied, The Wall, Theon Greyjoy, Tyrell, Tywin Lannister, Westeros, Ygritte | Permalink.